Last month, Isao Takahata passed away at the 82. Known for Grave of the Fireflies and The Tale of Princess Kaguya, among others, Takahata co-founded Studio Ghibli with Hayao Miyazaki, who recently gave a eulogy for his deceased colleague and friend. As Mainichi reports, a farewell ceremony was held at the Studio Ghibli Museum yesterday for Takahata. Miyazaki nicknamed Takahata “Paku-san” because of the quick way he ate breakfast while at Toei (“paku-paku” is the sound of chewing in Japanese). He recalled the first time they talked at a bus stop 55 years ago. Miyazaki was 22 years old. Takahata was 27. That was the start of their long-time friendship. “Nine years ago, we got a call from the doctor,” Miyazaki continued (via Cinema Today). In a series, dreadful voice, he said, ‘If you’re his friend, get Takahata to stop smoking.’” The doctor’s warning made Miyazaki and producer Toshio Suzuki agree to get Takahata to quit—something that neither Miyazaki or Suzuki did. “And then, Paku-san really stopped smoking. On purpose, I’d go next to him and smoke,” Miyazaki said. Takahata said he thought the cigarettes smelled good, but that no longer wanted to smoke. Miyazaki, however, said it was all an act. 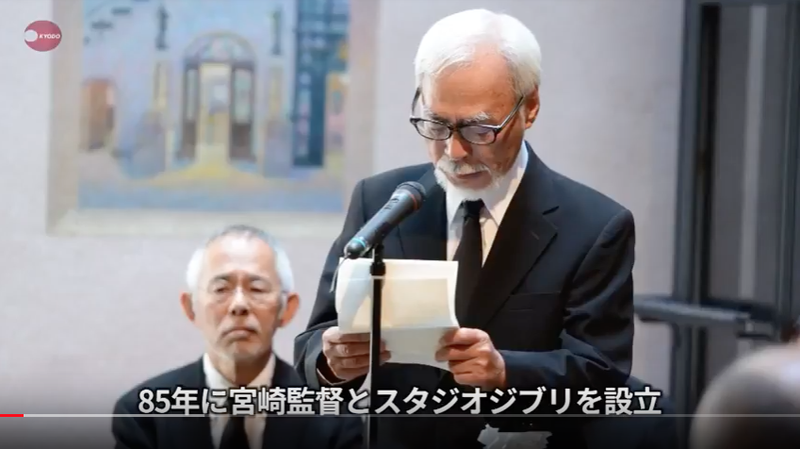 Most of Miyazaki’s eulogy was a reflection of knowing and working closely with Takahata. He ended the eulogy tearfully, thanking Takahata for talking to him at the bus station 55 years ago. On April 5, Takahata died from lung cancer at the age of 82, so while Miyazaki didn’t sound malicious, perhaps another anecdote might’ve been better? You can watch more footage of the farewell ceremony right here.